Go on! Indulge in the very best movie-promo tie-in ever: the Oblivion-branded Mandatory Memory Wipe, available at the concession stand. Then walk into Oblivion with no recollection of 2001: A Space Odyssey and Independence Day and 2012 and Mad Max 2: The Road Warrior and Planet of the Apes and the entire history of science-fiction movies. You’ll enjoy yourself much more. A “mandatory memory wipe” is exactly what Jack Harper (Tom Cruise) has undergone, a security measure in case he gets captured by the alien Scavengers still scurrying around on Earth even though they lost a war with humans. It’s Jack’s job to keep in the air the fleet of drone weapons that are protecting, from Scav attack, the fusion reactors that are turning Earth’s oceans into a power source for Titan, the moon of Saturn to which the human survivors of the war have decamped. Only two more weeks to go in his tour of duty, and then it’s his turn to head out to the new paradise on Titan. If you believe that, I’ve got a bridge in Brooklyn—only slightly damaged by some minor planetary crustal displacement—to sell you. To be fair, there is some small downside to experiencing Oblivion on Mandatory Memory Wipe. Earth may be a radioactive wasteland, but it’s a bright, sunny kind of post-apocalyptic hellscape; you won’t recall that we haven’t seen this before in a science-fiction film, and it is strikingly original. The film on the whole is far more visually intriguing than writer-director Joseph Kosinski’s debut, the ugly Tron: Legacy. 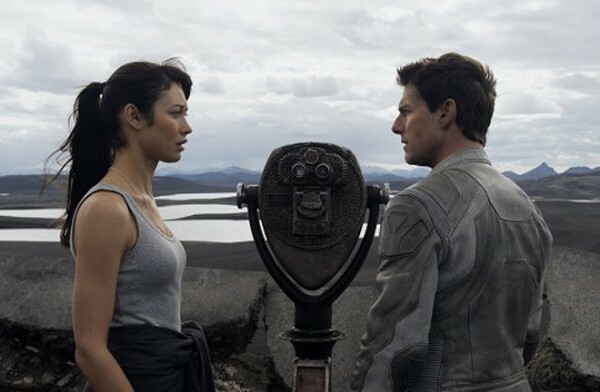 If you’re going to see Oblivion, see it in IMAX, where you’ll get some geeky satisfaction out of its rendering of planet Earth as a newly alien place. Just don’t expect to be much surprised by the derivative plot or characters.